An important conversation around how we can create supportive and engaging learning environments began in the form of a training in the Art of Hosting and Harvesting Conversations that Matter. Participants from 15 countries stepped boldly into a rich program combining theory, tools and opportunities to practice learning in collaboration. After arriving in Ba Vi, the outskirts of Hanoi, participants were welcomed into the beautiful space of Family Resort to start a four-day learning journey together. Our steward Steve shared about the Circle Practice, after which we had our first check-in together, where all shared what name we’d like to be called by others, what work we’re here to do in the world, and what supports our learning. After a delicious vegan dinner, people from all walks of life, including teachers, trainers, facilitators, business leaders, NGO workers, and individuals who want to create a safe space for learning explored the Four-Fold Practice (host yourself, be hosted, host others, community). 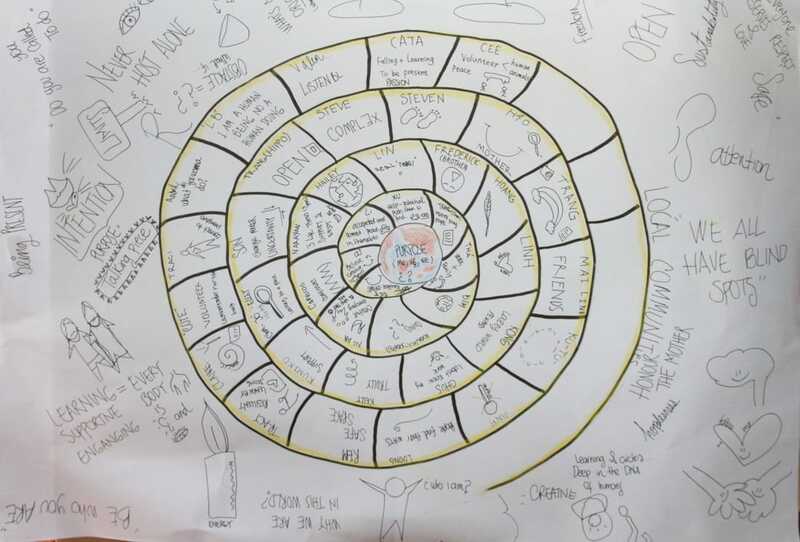 ​The participants then signed-up to practice hosting conversations using the methodologies of the Art of Hosting, after which we checked-out with a movement to express how we were feeling about being in this learning community, and prepared for the next day. Check-in Questions: What do you want to be called, what is your work in the world and what supports your learning?